Cover artwork for the single was also revealed, featuring an illustration created for the title by the director of the KINGDOM HEARTS series, Tetsuya Nomura. It illustrates Hikaru Utada standing upon a body of water holding the signature weapon of the game, a keyblade. It's a rarity and treat for Hikaru Utada fans as well as KINGDOM HEARTS fans. This marks the second time collaborating with Tetsuya Nomura for artwork illustrations, the first was in 2014 for promotions of her book "Utada Hikaru no Uta." Fans can listen to a preview of the song in the game's opening movie trailer, in both Japanese and English. 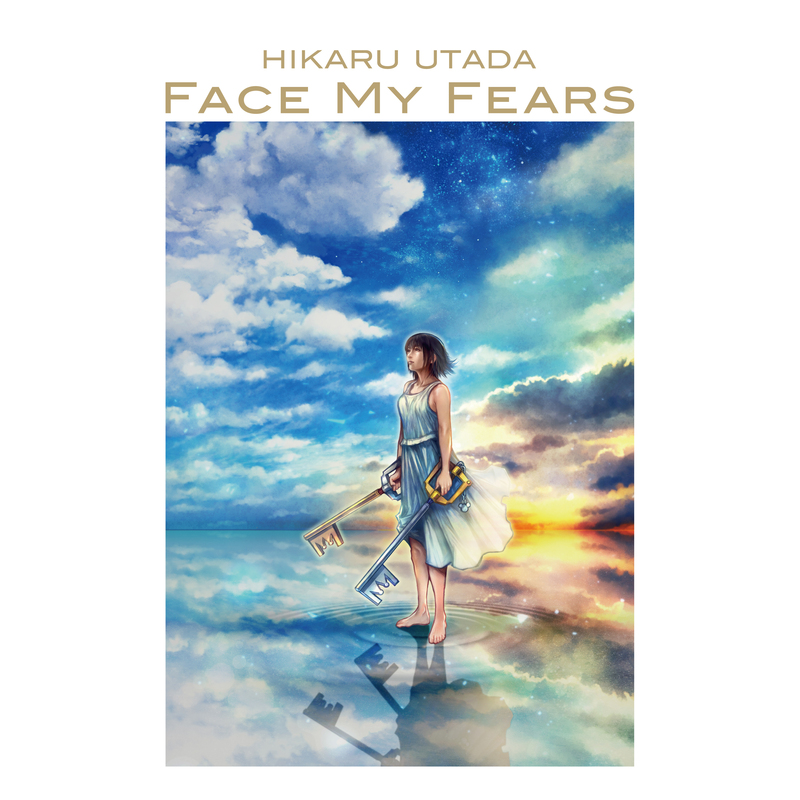 "Face My Fears" will be released alongside the English-language ending theme "Don't Think Twice" on January 18th, 2019. Preorder now from iTunes or from various Japanese retailers! Beautiful art of our beautiful queen, Nomura! Oh I love that she is holding both the Kingdom Key and Kingdom D!!!. I feel like crying tears of joy . This reminds me of Yuna from FFX. So beautiful! My thoughts exactly. Really good cover. I'm still blinking myself awake and there is just so much going on and I'm pinching myself. Why is it that whenever Utada steps up is when this franchise fires on all fronts. OK so yes this artwork is great and I can't wait for the full song. That taste was just so bittersweet. Also I'm feeling like Hikki as a KH3 secret boss is now on the table. Thanks for this - was worried when I couldn't find it on iTunes! Yeah this is gorgeous and unexpected! The cover/artwork is excellent, I like it a lot. I honestly can't wait to hear the full version of DTT. I hope it gets uploaded somewhere soon! This is gorgeous~ I want a wallpaper of it.